SwiftKey, the company behind the popular SwiftKey Keyboard, has launched the Swiftmoji keyboard app for Android and iOS. To recall, the keyboard app which suggests emojis as you are typing was first introduced for Android in beta back in May. This is company’s first launch after its acquisition earlier in this year by Microsoft. The predictive emoji keyboard app behaves just like a normal SwiftKey Keyboard, but additionally predicts and suggests emojis based on what you’ve written so far. Take for example, if you write the word cooking in the Swiftmoji keyboard, it will suggest various emojis that are related to cooking and dishes. It also bases suggestions on ‘worldwide emoji trends’. “The app works by using the context of what you’re typing coupled with worldwide emoji trends to give you the best and most topical emoji predictions,” the company said in an emailed statement on Wednesday announcing the launch of the emoji prediction keyboard app. The company said that in its review, it found that certain people were associated with particular emojis. For example, the goat emoji crops up for Muhammad Ali – the acronym G.O.A.T signifying Greatest of All Time, while the crown and honeybee emoji for fans of Queen Bee Beyoncé, SwiftKey said. 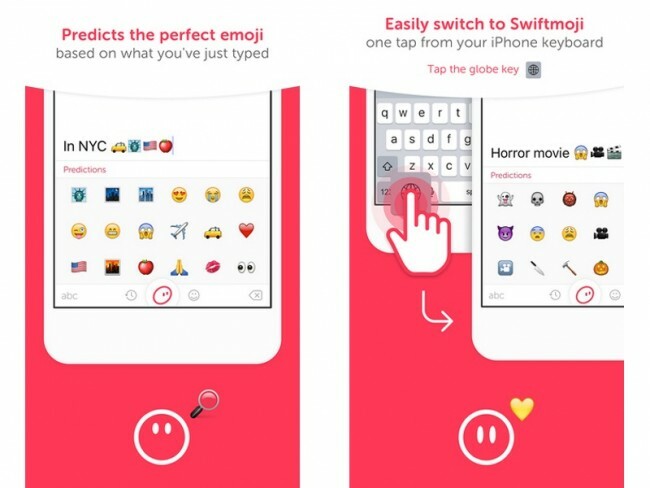 Swiftmoji app is also powered by the “same core technology” that has been used for autocorrect and predictions on the SwiftKey Keyboard, the company said. For now, the Swiftmoji keyboard is only available in English on both Android and iOS. On Android, the app can act as a full keyboard replacement,while on iOS it will act as an emoji keyboard.